This is my 48th installment of Babywearing Stories 365. Each installment features a babywearer in 1 photograph and their answers to 5 questions. My goal is to normalize, promote and celebrate daily Babywearing, moving beyond *what* we use to carry our babies and shifting focus back on *why* and *where* we carry. I hope to share the stories of moms, dads, and babywearing caregivers all over the world. Enjoy! 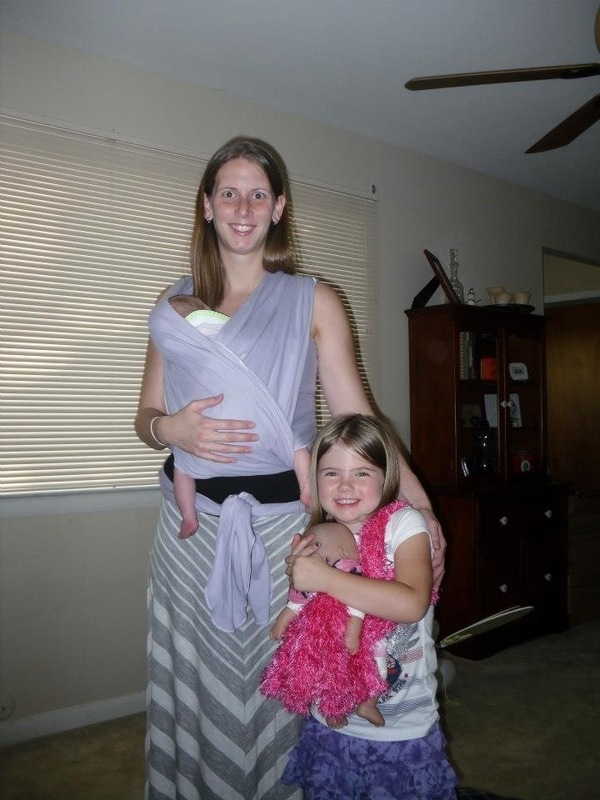 This is a picture of me (Amy) wearing my then 4 week old Hannah. Next to me is my big girl Sarah (4) wearing her baby doll. I am wearing Hannah in a lovely lavender Moby wrap given to me by a friend. Sarah is wearing her baby in a hot pink feather boa that we fashioned into a wrap. We had just gone to our first baby wearing meeting earlier that day. I came home and was trying out what I had learned. My big girl of course wanted in on the action. Hannah is now 9 months old and gets so excited when I get out any of our carriers. And my big girl loves to wear her dolls when she plays Mommy. I wish I had been more familiar with baby wearing when Sarah was little, but I love that she will grow up seeing me wear her baby sister and any other siblings that might come along. I love that when Hannah is cranky, my big girl will tell me that her sister needs ‘carried’.